Bryce Napier picked up the 1st last-place finish of his NASCAR Camping World Truck Series career in Saturday’s Alpha Energy Solutions 250 at the Martinsville Speedway when his #1 ASAP Appliance Service Chevrolet was parked 3 laps into the 250-lap race. The finish came in Napier’s fourth series start. Napier is just 17 years old, but has already been racing for over a decade. Born outside Santa Cruz, he’s raced quarter midgets to late models at tracks all across California, including the All American Speedway and Stockton 99 Speedway, the latter the site of two wins in 2014. In 2015, Napier was part of the inaugural class for the Kulwicki Driver Development Program. Named for his hero, the late 1992 Winston Cup champion Alan Kulwicki, Napier was one of just 15 finalists, including Ty Majeski. 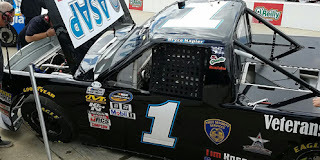 Just last year, Napier made his Truck Series debut at Martinsville. Driving for Jennifer Jo Cobb in the #1 Lily Trucking Chevrolet, he finished a career-best 23rd, then finished inside the Top 30 in two more starts at Bristol and Phoenix, both while driving for Jay Robinson’s Premium Motorsports. Saturday’s return to Martinsville would be Napier’s first attempt of the 2017 season. Sponsorship from ASAP Appliance Service (based in Napier’s home town of Scotts Valley, California) was joined by a collection of others, including Veterans Motorsports Inc., Harry’s Auto Repair, Tim Rose Construction, and First Security Services. Napier would drive for TJL Motorsports, a new team announced on February 15, 2017. The team splintered off from MAKE Motorsports (now Beaver Motorsports), which itself was aligned with Jennifer Jo Cobb Racing last year. The #1 team is owned by Tracy Lowe, MAKE’s Chief Operating Officer, who is operating her own team for the first time. While driver Tim Viens missed the cut for TJL’s debut at Daytona, the #1’s rank in Owner Points was enough to lock Mike Harmon into the field at Atlanta, and would also help Napier make the show in Martinsville. 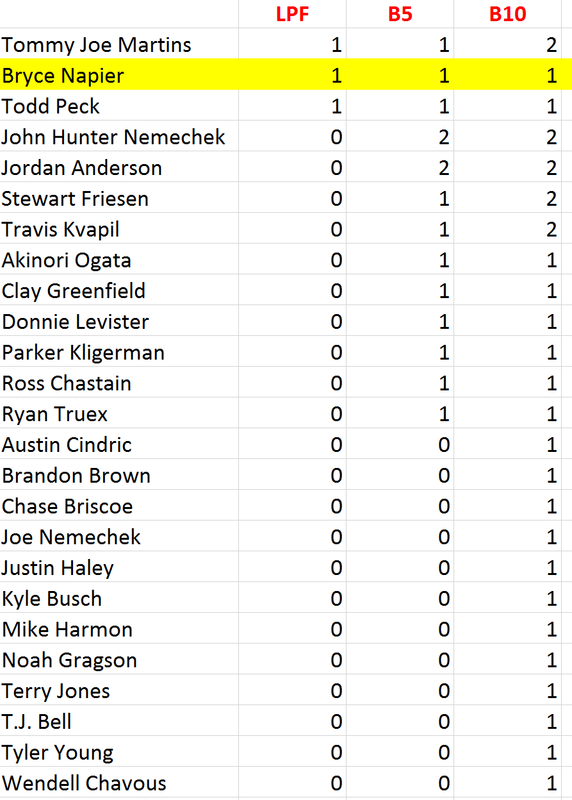 Napier and TJL weren’t on Martinsville’s preliminary entry list, which first indicated just 32 trucks would arrive to attempt that many spots. However, by Friday, Napier was added in the #1 along with Beaver Motorsports’ #50 with Travis Kvapil, T.J. Bell in the #45 Neice Equipment / Autry Grading Chevrolet, and Brandon Brown. Brown’s #44 Chevrolet, fielded by Brandonbilt Motorsports and Martins Racing, wasn’t originally going to enter until a successful fan-supported push during the week. By Friday, his white truck had a large decal on the rear deck with the Twitter handles of 680 supporters. 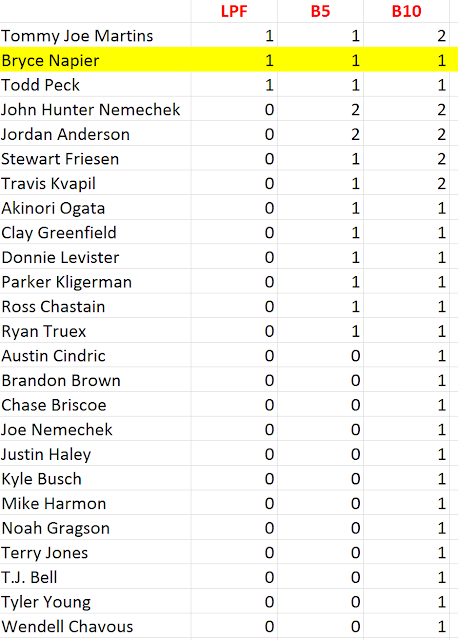 When Richie Wauters withdrew Korbin Forrister’s #5 Toyota, this meant that 35 trucks would now compete for a spot in the field. Napier ranked 33rd of the 34 drivers to run in Friday’s opening practice, then secured the 29th starting spot on Owner Points, having put up a lap of 89.587mph. Bumper from the field were Austin Wayne Self, who purchased Martins Motorsports’ spot in the Martinsville field last year, owner-driver Norm Benning in his #6 Houston Roll Pipe / Diamond G Inspection Chevrolet, and Jennifer Jo Cobb’s entry, which she this week handed to Chuck Buchanan, Jr. Buchanan, who in three previous unsuccessful attempts fielded his own Spring Drug-sponsored entry, did not complete a lap in qualifying, and will once again have to wait for his series debut. Starting last on Saturday was Jordan Anderson, who like Brandon Brown had a fan-supported story of his own. Just weeks after a devastating wreck at Atlanta totaled Rick Ware’s only truck, the team got the #12 Lucas Oil Chevrolet back from the chassis shop on Thursday. In just over 24 hours, the team fashioned a front and rear clip onto the machine, brought it to Martinsville, and made the cut with a lap of 86.092mph. By race day, Anderson was joined by Justin Haley, Travis Kvapil, Donnie Levister, and Napier, all sent to the rear for unapproved adjustments. Anderson exited the race 21 laps later, citing brake trouble on the rebuilt #12. Behind him in 30th came Donnie Levister. Like Chuck Buchanan, Jr., Levister had been entered in five races previous and was now locked-in driving D.J. Copp’s #83 Frontline Designs Chevrolet. Brake issues eliminated Levister from the field just short of the halfway mark, 86 laps before the engine let go on Travis Kvapil’s #50 Motorsports Safety Group Chevrolet. Rounding out the Bottom Five was John Hunter Nemechek, who lost 24 laps with recurring engine troubles on his #8 D.A.B. Constructors Chevrolet. *This marked the second-consecutive last-place finish for the #1 in a Truck Series race at Martinsville. Last fall, when Jennifer Jo Cobb fielded the #1 Hurricane Master Garage Doors / Liftmaster Chevrolet, driver Josh White was eliminated in a crash after 45 laps of the Texas Roadhouse 200. *This marked just the second time a Truck Series driver was classified last with “parked” as the official listed cause. The other time also occurred at Martinsville. On April 9, 2005, Casey Kingsland, making his series debut, was parked after 104 laps of the Kroger 250 after his #24 Speed Zone Energy Drink Dodge brought out three of the race’s first six cautions.